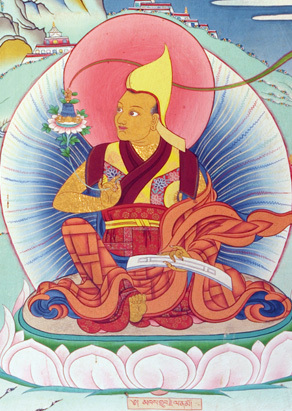 Khedrup Gelek Palzang (Tib. མཁས་གྲུབ་དགེ་ལེགས་དཔལ་བཟང་པོ་, Wyl. mkhas grub dge legs dpal bzang po) aka Khedrup Je (Tib. མཁས་གྲུབ་རྗེ་, Wyl. 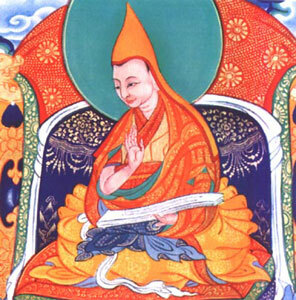 mkhas grub rje) (1385-1438) was one of the main disciples of Je Tsongkhapa, famous for his polemical writings. He played a key role in shaping the Gandenpa tradition of his master and making it a separate school. Khedrup Je was born in Tsang in 1385. He was educated at Sakya Monastery and was ordained by Je Tsongkhapa's teacher Rendawa. He first met Tsongkhapa when he was 18, and went on to become one of his leading disciples. He became very learned, especially in the tantras, writing nine volumes on the sutras and tantras, including a voluminous commentary on the Kalachakra Tantra. He founded Gyantse Palkhor Chöde Monastery. After Tsongkhapa's passing away he became his second successor as abbot of Ganden Monastery succeeding Gyaltsab Darma Rinchen. He held the office for six years, passing away in 1438. His incarnation line became known as the Panchen Lamas. Cabezón, José Ignacio. A Dose of Emptiness: An Annotated Translation of the Stong thun chen mo of mKhas grub Dge legs dpal bzang. Albany: State University of New York Press, 1992. This page was last edited on 4 June 2018, at 06:41.